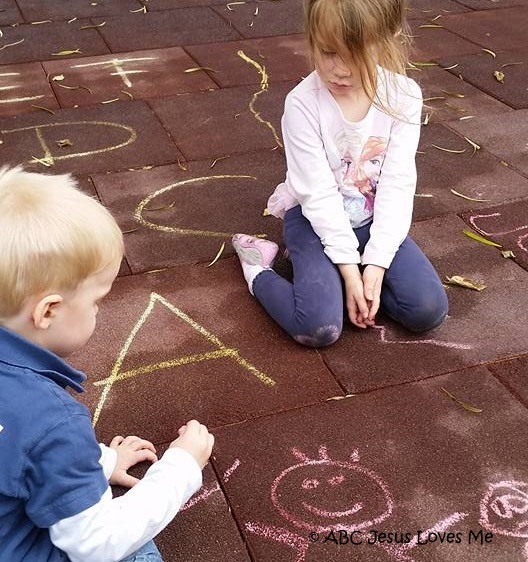 There are many great games to play with preschool children. Fun gross motor activities that will bring smiles to the kids' faces. Please let me know if you have one to add. Doggy, Doggy, Who Has the Bone? Sit the children in a circle. Chose one child to walk around the outside of the circle carrying a handkerchief, letter, or other item while a song is sung or played. At the moment the song ends, the child drops the item behind the nearest child and runs around the circle. The child whom the handkerchief was dropped behind chases the first child until one of them reaches the empty spot. If the first child reaches the empty spot first then the second child becomes "It." If the second child reaches the empty spot first the first child remains "It." Pair up the children leaving one child as the “caller”. The caller gives directions to the partners to perform. (i.e. line up back to back, foot to foot, elbow to elbow, shoulder to shoulder) When the caller yells “back to back”, everyone must find a new partner. The one left over is now in the middle. In a spacious area (either indoors or outside), mark off a playing area (the size will depend on the number of children playing). Make sure that the area is free of dangerous obstructions. Designate one player as "It." Place a blindfold on the child. The child will then attempt to touch other players without being able to see them. The other players will try to avoid being touched by the person who it "It." Button, Button Who Has My Button? Choose one child to be "it." He should sit blindfolded in the center of the circle of children. Have an adult give the button to one of the children. Have all children hide their hands behind their backs. Uncover the child's eyes and allow three guesses as to which child has the button. Whomever has the button is the next person it. A group of players sit in a circle, facing inward. Choose one player to be the "picker" (or the 'fox'). The picker walks around tapping each player on the head, calling each a "duck" until finally picking one to be a "goose." The goose stands up and immediately begins chasing the picker around the circle in an attempt to tag the picker. The goal is for the 'picker' to return and sit where the goose had been sitting without being tagged. If the picker succeeds, the goose is now the new picker and the process begins again. If the goose succeeds in tagging the picker, the goose may return to sit in the previous spot and the picker resumes the process. Choose a leader for the head of the line. The rest of the children line up behind the leader. The leader then moves around and all the children have to mimic the leader's actions. Any players who fail to do what the leader does are out of the game. The winner becomes the new leader. Read the book We're Going on a Bear Hunt - This is a wonderful book to work on spatial relationships. Act out as you read. Here is a Printable Story Pattern to help with the sequence. Glue flannel material on the back and create a wonderful flannelgraph story. ABCJLM Version - Here is one version to act out! Have child repeat each line after you. Going on a "Lion" Hunt (Traditional) is used in the curriculum as a gross motor activity and to supplement the Bible story - Daniel in the Lion's Den. Have the child repeat each sentence after you and don't forget the actions! Choose one person to be the seeker. This person will look for everyone else. The rest of the group hide in the designated area. The seeker stands at a home base, covers his eyes and counts to 20 or 30 while everyone else hides. When finished counting, the "seeker" says loudly, "Ready or not, here I come!" and runs to find the other players. The hiders remain very quiet, and the last person to remain hiding without being found is the winner and is the next "seeker." Gather everyone in a circle and follow the directions of the song by putting different body parts in and out of the circle. Choose one person to be the seeker. Have that person leave the room while everyone else hides one small object. When the seeker returns to the room, the rest of the group tells him whether he is hot (close to the item) or cold (far from the item) until the objects is find. Similar to musical chairs, children sit in a circle and pass a potato, or any other object, around the circle as quickly as possible. The object is to not be the one holding the potato when the music stops. Choose one child to be the spy. Have the child choose an object in the designated space that is visible to all of the players. Once the object is chosen, the spy declares “I spy, with my little eye, something [adjective or alphabetical letter].” For example, if the spy chooses a beach ball, the spy would say “I spy, with my little eye, something round” or “I spy, with my little eye, something that begins with ‘B.’” The rest of the children take turns guessing until someone correctly guesses the object. Leapfrog is a continuous game of leaping over the back of those in front of you and then allowing the behind to leap over your back. The first person kneels on the ground and then bends over. The next player places his/her hands on the first person's back and leaps over by straddling legs wide apart on each side. On landing he kneels and bends as well and a third leaps over the first and second, the fourth over all the other, etc. When all the players have "leaped" and are on the ground, the person at the last of the line begins leaping over all the others in turn and the game continues. Shake them up with salt and pepper, my fair lady. Choose 2 children to create an arch with their arms by facing each other, joining both hands together, and lifting their arms up. Line up the rest of the children so they can walk under the arch in a single file line. Begin singing the first verse. While singing, have the children walk in a line under the arch and back around, creating a circle of children consistently walking under the arch. On the last word (lady), instruct the 2 children to drop their hands down to capture a child between their arms. Gently, rock the captured child back and forth while singing the second verse. Repeat these actions with the same verses or additional verses of the rhyme until all the children are captured. Choose one player to be the "mother/father." Line the rest of the players arms length apart on the opposite side of the room. The children take turns asking "Mother/Father, may I ____?". For example, "Mother/Father, may I take five steps forward?" The mother/father either replies "Yes, you may" or "No, you may not do that, but you may _____ instead" and inserts his/her own suggestion. The players usually move closer to the mother/father but are sometimes led farther away. Even if the mother/father makes an unfavorable suggestion, the child must still perform it. The first player to reach the location of the mother/father wins the game. That child then becomes the mother/father himself, the original mother/father becomes a child, and a new round begins. If the "children" are reaching the "mother" or "father" too quickly, the "mother"/"father" may reject the child's suggestion by replacing it with "No, you may not do that, but you may ____ instead." • Reduce the original child's suggestion. For example, reduce five giant steps to three giant steps. • Walk backward until I (mother/father) say "stop"
Arrange chairs (facing outward) in a circle using one chair less than the number of players. Have the children stand in a circle just outside the chairs. A non-playing individual plays recorded music or a musical instrument. While the music is playing, the players in the circle walk in unison around the chairs. When the music stops, everyone races to sit down in one of the chairs. The player who is left without a chair is eliminated from the game and one chair is removed from the circle. The music resumes and the cycle repeats until there is only one player left in the game, who is the winner. Sit the children in a circle with the palms of their hands together and one person sitting in the middle who is "it" and one person who has the penny. The person with the penny slides their hands through each child's hands, depositing the penny in one person's hands without anyone knowing. With everyone sitting with their palms together, the person who is "it" receives three guesses as to who has the penny. If he guesses correct, he gets to be the person distributing the penny. If not, the person who was it distributes the penny again. Hang a picture of a donkey with a missing tail on a wall within easy reach of children. One at a time, each child is blindfolded and handed a paper "tail" with a push pin or thumbtack poked through it or double-sided tape placed on it. The blindfolded child is then spun around a few times to disorient the child. The child gropes around and tries to pin the tail on the donkey. The player who pins their tail closest to the appropriate placing wins. Choose one person to be the "light". Line the rest of the players arm width apart at the other end of the space. The "light" turns his/her back to the others and calls out "Green light!" The players then run as fast as they can towards "the light". At any time, the "light" can turn and face the players, calling out "Red light", and the others must freeze in place. If anyone fails to stop, they must return to the starting line. Other variations include calling out "Yellow light" as a diversion, or signaling the players to walk instead of run. The first player to reach the "light" wins and becomes the "light" for the next round. This game is a fun way to practice the obedience of stopping when told to do so. Using only the green (go) and red (stop or freeze) concepts of this game, play this game while on a trampoline, doing an activity at the park, or running or walking beside each other. Teach the child to immediately stop when given the "red light" command. If the child learns this skill, it can be used in an emergency situation such as a parking lot. The game is played between two lines of children, approximately thirty feet apart, facing each other. Each team holds hands to form a chain. One of the sides huddles together and decides one person from the other team that they want to have run over to their team. The game starts when the first team calls out, "Red rover, red rover, send [name of player on opposite team] right over." The immediate goal for the person called is to run to the other line and break through the opposite team's chain. If the person called fails to break the chain, this player joins that team. However, if the player successfully breaks the chain, this player may select one person from that team to join his/her team. Next the other team decides who they want to call over and play continues. Play until one team no longer has any players. Choose a child to be "Simon" who will issues physical instructions to the rest of the players (i.e. jump in the air, rub your heard, stand on one foot). Instructions are only followed when prefaced with the phrase "Simon says", for example "'Simon says jump in the air." Players are eliminated from the game by either following instructions that are not immediately preceded by the "Simon says" or by failing to follow an instruction which does include "Simon says." The goal of "Simon" is to get all the other players 'out' as quickly as possible. The winner of the game is the last player following instructions. Line the children up and count them off as Tree...Tree...Squirrel repeating the pattern until one or two children are left. The extra children are Squirrels looking for a home in a Tree. Instruct the Trees to pair up by grabbing hands and encircling a Squirrel (a few squirrels will not have trees). Have the Trees with Squirrels spread around the space. At the whistle all the Squirrels leave their Trees for another Tree. The Trees open their arms waiting for a new Squirrel and when they have one they encircle the Squirrel. Any Squirrels without a Tree must wait until the next whistle in order to find a new Tree. A player who is selected to be "it" chases the others players, attempting to tag them by touching them with their hand while the others try to escape. Once tagged, that player becomes "it." And the game continues. - Make tag an elimination game so those tagged drop out of play. - Freeze Tag : When a player is tagged, they freeze in spot. The player can be unfrozen by another player (not the "it" person) by either tagging the frozen person who or crawling between the frozen person's legs.